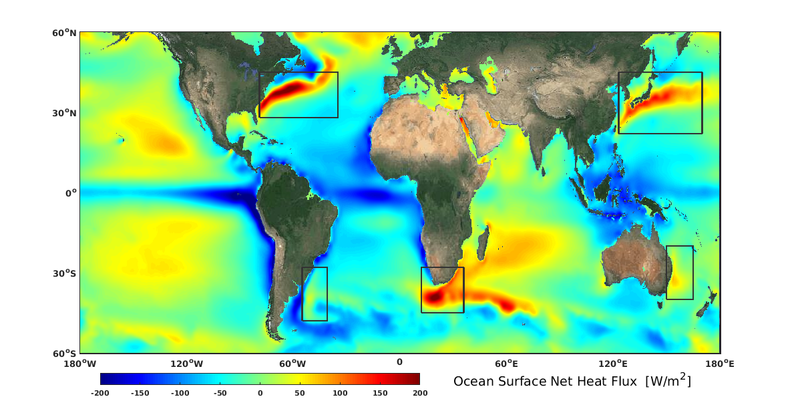 Global warming results in fundamental changes to important ocean currents. As scientists from the Alfred-Wegener-Institute show in a new study, wind-driven subtropical boundary currents in the northern and southern hemisphere are not only going to increase in strength by the end of this century. The Kuroshio Current, the Agulhas Current and other oceanic currents are shifting their paths towards the pole and thus carry higher temperatures and thus the risk of storms to temperate latitudes. For this study, researchers evaluated a wealth of independent observational data and climate simulations. They showed the same pattern for all boundary currents, with the Gulf Stream as the only exception. According to the data, the latter will weaken over the next decades. The study has been published today in the Journal of Geophysical Research professional journal. Along the eastern coasts of South Africa, Asia, Australasia, and South America, weather and climate will get significantly warmer over the next 100 years and thus presumably also significantly stormier on global average. The reason for this are changes to the western boundary currents that are already beginning to have a significant impact on weather events in these coastal regions. 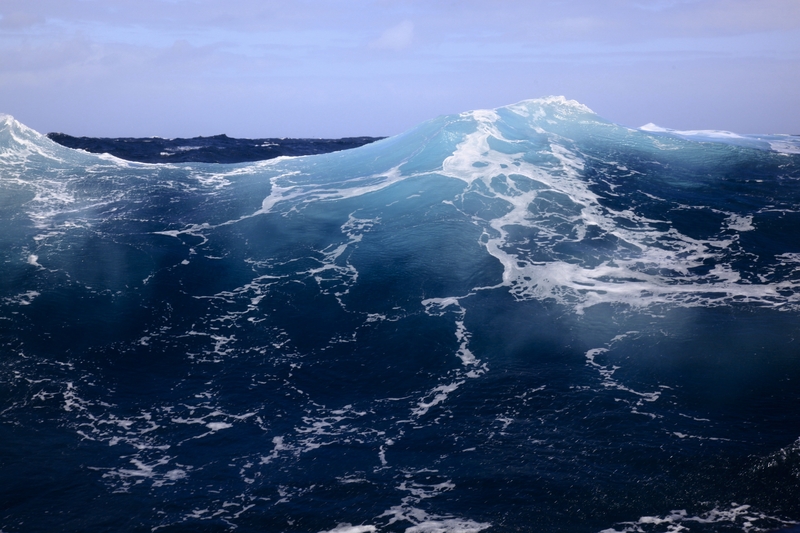 These surface currents are driven by the wind; with flow speeds of up to nine kilometres per hour, they are amongst the fastest ocean currents in the world. They reach down to a depth of 1000 metres and move warm bodies of water from the tropics to the coastal regions of the temperate latitudes. The best-known western boundary current in Europe is the Gulf Stream. Across the world, however, these also include the Kuroshio Current off the coast of Japan, the Brazil Current off the eastern coast of South America, the Eastern Australia Current as well as the Agulhas Current off the coast of South Africa. Scientists from the Alfred-Wegener-Institute, Helmholtz Centre for Polar and Marine Research (AWI) have discovered these changes in a major comparative analysis of eleven independent climate data bases. On the one hand, the scientist evaluated oceanographic observational data as well as satellite data on the currents’ heat loss between 1958 and 2001. On the other, they considered simulations for past and future climates as well as indicators for the flow speed of the currents, for water temperature and air pressure at the sea surface. “Our analysis shows that the surface temperature of the boundary currents has increased two to three times faster than in other oceanic regions. In addition, the currents release 20 percent more heat than they did half a century ago, which leads to the conclusion that the temperature of the water has risen, its flow speed has increased and the currents thus transfer more water and also more heat from the tropics towards the pole. The cause of these changes were increasing winds in both hemispheres,” explains Hu Yang, AWI climate researcher and author of the study. The greater the heat transfer from the sea, the higher possibly the probability of storms. “Over the next decades, Japan, China and Korea will need to expect higher air temperatures particularly in winter, because the Kuroshio Current will transport more heat and shift northward with the wind. This heat will change the atmospheric condition in such as way as to make storms more likely in this region. For the Eastern Australian Current, the Brazil Current and the Agulhas Current on the southern hemisphere, our analyses predict a southward shift, because there, too, the winds shift poleward,” explains Prof. Gerrit Lohman, climate modeller at the Alfred-Wegener-Institute and co-author of the study. The ocean get heat from the tropical regions and release them to the mid-latitudes, especially over the routes of the subtropical western boundary currents. In a warming climate, the subtropical western boundary currents (except the Gulf Stream) are going to be stronger and shifting toward the poles. They will bring more heat and contribute to a much warmer climate over the adjacent regions (e.g.., Japan, China). Warmer, stronger, poleward - according to the results, this pattern applies to all western subtropical boundary currents. The only exception is the Gulf Stream. “All of our results predict its long-term weakening. The reason for this is that the Gulf Stream is not only driven by the wind, but is also coupled with the thermohaline circulation. This is also often referred to as a global conveyor belt. Our results indicate that the power of this conveyor belt will weaken in the long term - and in an order of magnitude that more than compensate for the plus of increasing winds. Without the influence of this circulation, the Gulf Stream would follow the same patterns as the other boundary currents,” outlines Gerrit Lohmann. The climate scientists also fear far-reaching consequences for the fauna and flora of the coastal regions. “As these currents bring higher temperatures to these temperate latitudes, while advancing further north or south, many species will be forced to move to colder regions. But some of them won’t be able to face this challenge,” explains Gerrit Lohmann one of the possible consequences of the observed changes. This compendious hand-painted map of the world was produced in Dieppe for the King of France, and celebrates the recent discoveries of Jacques Cartier on the north-east coast of America. But it is more than simply a map of French glory for its ruler: it is a visual encyclopaedia of the legends, natural history and ethnography of the world. With it, the King could learn and display his worldly knowledge. The map was meant to be viewed on a table, and so the information to the top of the map appears upside-down to the modern viewer. It is the most extravagant of all geographical indexes. 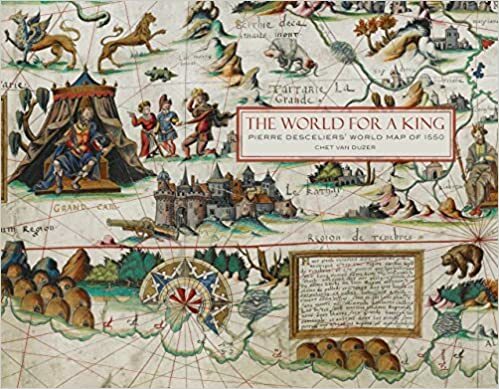 “The World for a King: Pierre Desceliers’ Map of 1550” by Chet Van Duzer was published last year by The British Library. Map aficionados will arrive from near and far for this weekend’s Map Mania Symposium at the New Mexico History Museum. Some will probably be guided to their destination by the reassuring voice of a GPS system built into their cars or accessed through their cellphones. Harnessing satellite communications to provide instantaneous global positioning has become the norm for navigation in the early 21st century, but the accuracy gained through this technology has come at the cost of another desirable trait of cartography: fantasy. Pasatiempo last met up with the work of cartographic historian Chet Van Duzer two and a half years ago, when we paged through his opulent volume Sea Monsters on Medieval and Renaissance Maps, published by The British Library. This lavishly produced new study features a full-scale color reproduction and commentary on one of the British Library's greatest treasures, the manuscript world map of 1550 produced by Pierre Desceliers. The map is one of the most important of the "Dieppe School" of cartography that flourished in Normandy from the 1540s to the 1560s. Chet Van Duzer's fascinating text situates the map in context among Desceliers' other surviving works; analyzes the map's many illustrations of people, animals, and cities; discusses its curious hypothetical southern continent; and includes translations of all the long descriptive texts on the map. The text makes a major contribution to cartographic history and to our understanding of one of the most beautiful maps ever produced. Following a substantial introduction, the map is reproduced at real size in 42 sections, each accompanied by detailed explanatory notes, and a reduced-size removable reproduction of the entire map is inserted at the back of the book. The product of several years' research, this study follows the author's best-selling Sea Monsters on Medieval and Renaissance Maps and is sure to appeal to the same wide audience of map-lovers. In that book, he focused on the beasts that populate the otherwise empty oceans of medieval and Renaissance maps, ranging from the hostile (such as the sawfish that swims beneath vessels and slices them in half) to the beneficent (the whale that allowed the friar Bernardo Buil to construct an altar on its back) and the merely curious (like the marine dog and marine chicken). Among the many fauna-filled maps he considered, Van Duzer passed fleetingly over Pierre Descelier’s “large … and gloriously coloured manuscript world map of 1550,” which he found to be “not very rich in sea monsters,” although it did have a few. That map, it turns out, was unusually interesting in other ways. It is the subject of his latest book, The World for a King: Pierre Desceliers’ Map of 1550, also published by The British Library and no less sumptuous than its predecessor. Van Duzer offers a précis of the map at the outset: “This book is about one of the most spectacular maps to survive from the sixteenth century, the world map made by the Norman cartographer Pierre Desceliers for presentation to King Henry II of France in 1550. 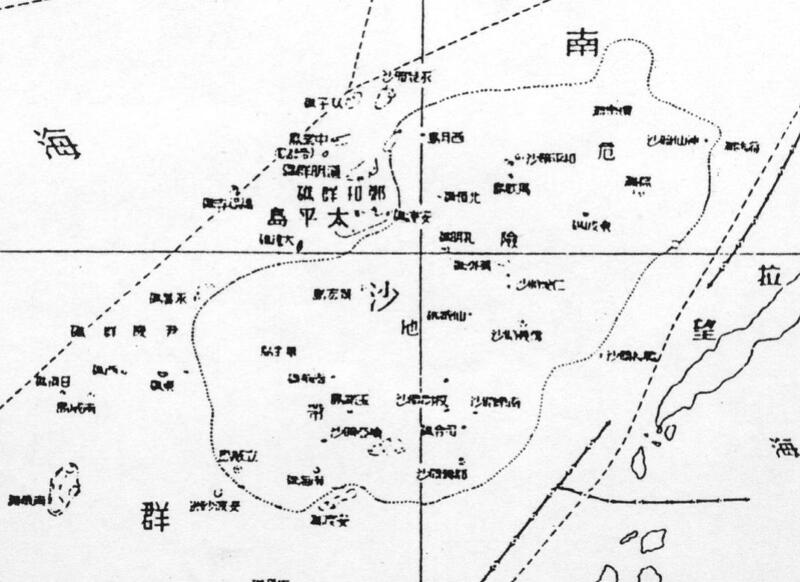 The scale of the map suggests that it was meant to be displayed on a table, with viewers ranged around it. Indeed, the inscriptions on the bottom half look normal to us, but those on the top half are upside down; that is a practical solution to aid legibility for readers standing on either side. Van Duzer knows how to read a map — which is to say, a map’s details come alive to him as embodiments of history, tradition, and individuality. Three coats of arms are drawn on Desceliers’ map — those of Henry II; Anne de Montmorency, Constable of France; and Claude d’Annebault, Admiral of France. Van Duzer believes that they provide a framework for understanding why this undertaking came about. It strikes him as unusual that the insignia of any high officials would grace the map along with that of the king, but he thinks their presence suggests that this map helped resolved a political altercation. Montmorency had fallen out of favour with Henry’s father, Francis I, toward the end of his reign, and Annebault had risen to become Francis’ favourite and most trusted counselor. But when Henry became king in 1547, he reinstated his friend Montmorency who, harbouring a grudge against Annebault and also eager to solidify his position as the king’s closest adviser, persuaded Henry to make Annebault understand that he was no longer welcome at court. In 1550, when Desceliers made his map, Annebault was still trying to find his way back into Henry’s favour — and into Montmorency’s as well. In fact, the best explanation of the coats of arms on Desceliers’ 1550 map is that the map was a gift from Annebault to Henry and Montmorency, part of his efforts to restore himself to their good graces, and perhaps a signal of his desire to cooperate with Montmorency. 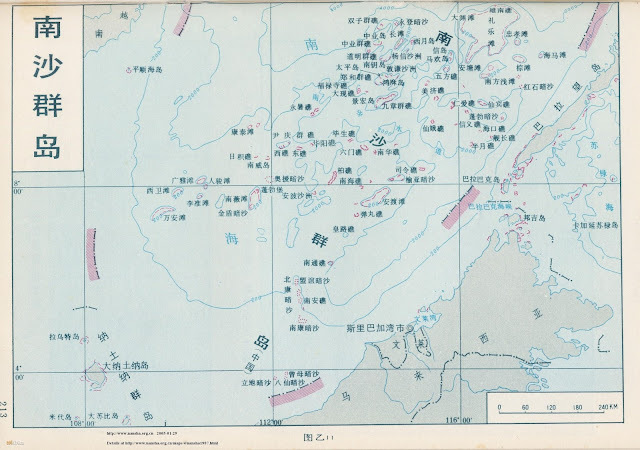 … This map’s extravagant decoration may be seen as Annebault’s attempt to give a gift so beautiful as to dim all memory of resentments past, and a nautical chart is certainly an appropriate offering from an admiral. 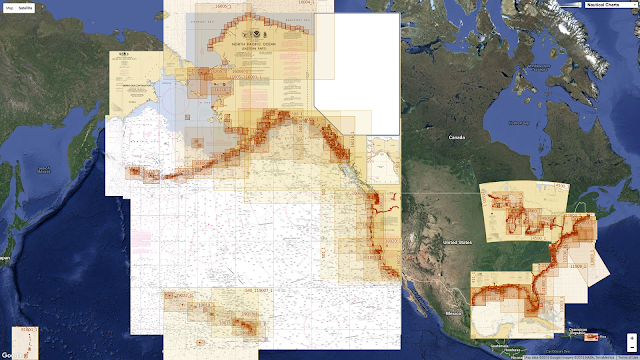 It does indeed fall in the tradition of nautical charts. 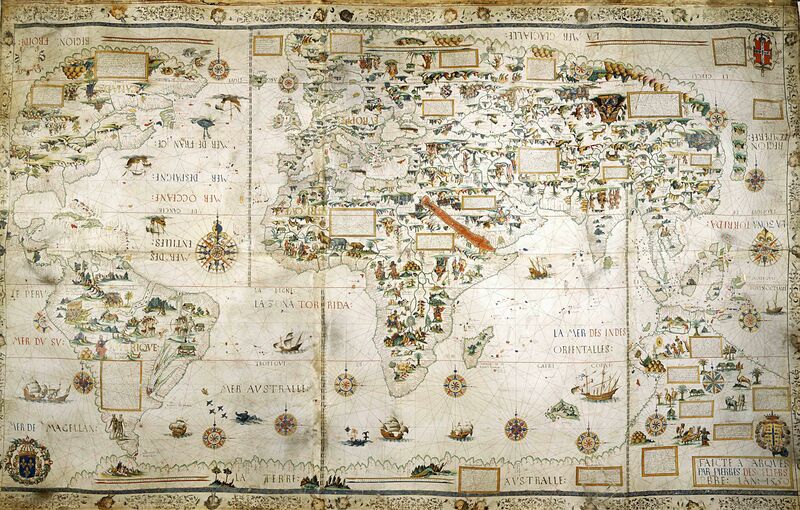 These were the most common kind among maps that charted large areas or, as here, the world. It stands to reason: Most exploration in the 16th century was achieved aboard ship. Explorers experienced distant lands mainly from sailing along their perimeters, with forays to the interior being rare in comparison. Apart from the paucity of sea monsters, Desceliers’ decoration is marvelous. It was almost certainly carried out not by Desceliers himself, but rather by a specialist artist in his workshop. 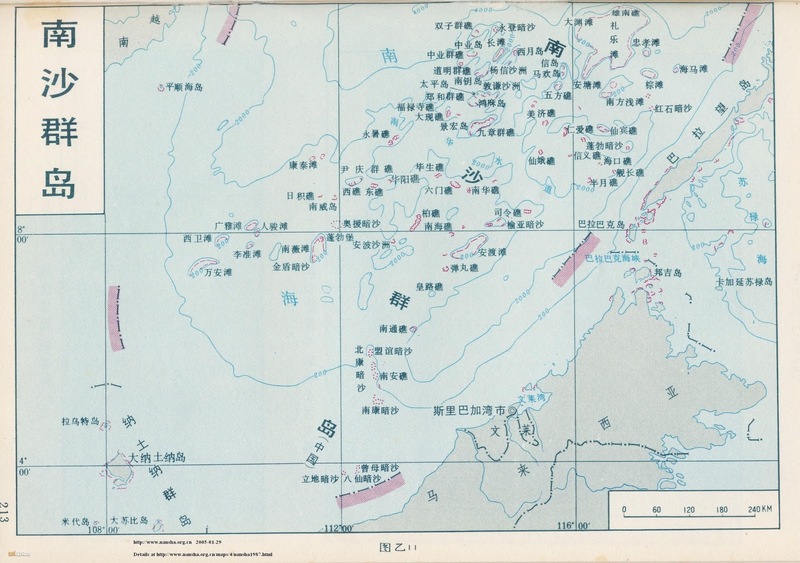 Desceliers would have been more personally involved in the aspects more directly bearing on navigation: the accuracy of coastlines and land masses, the proper situation of cities, the overlay of a geometric grid of lines that would have been relevant to mariners plotting courses. 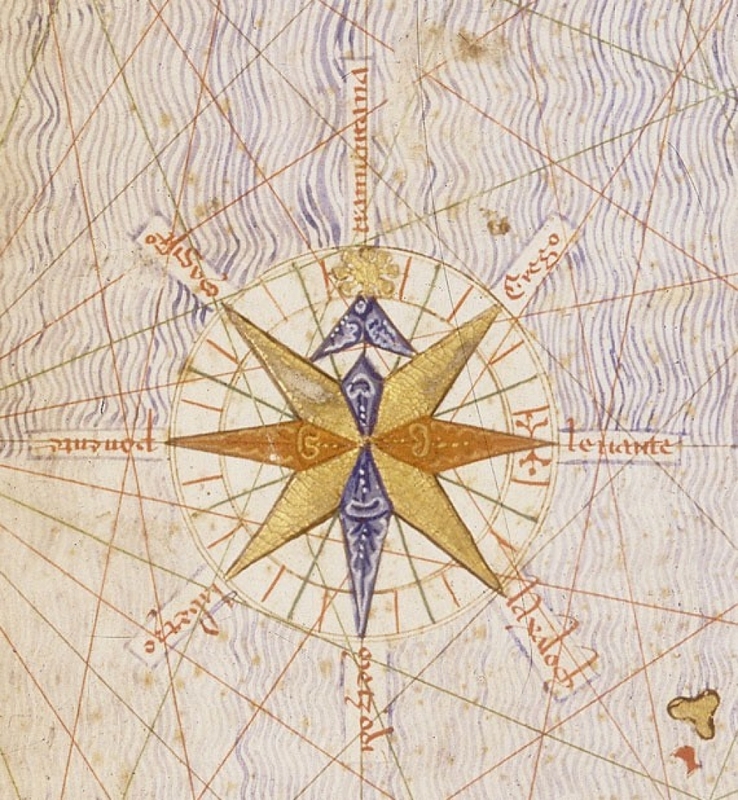 In many ways, Desceliers’ map is accurate by the standards of 1550. It reveals that he was reasonably conversant with the information coming in from European explorers in distant corners of the globe. Nonetheless, the mapmaker resists giving up on certain longstanding beliefs and traditions, some of which date back to Ptolemy and even earlier. So far as geographical accuracy is concerned, the map does quite well with Europe, although the scale is somewhat off and Scandinavia is plotted with considerable vagueness. The city of Paris appears prominent beyond reasonable proportions, but of course there was a political reason for that. Africa and Asia are pretty much on target, while South America and North America show considerable room for improvement. 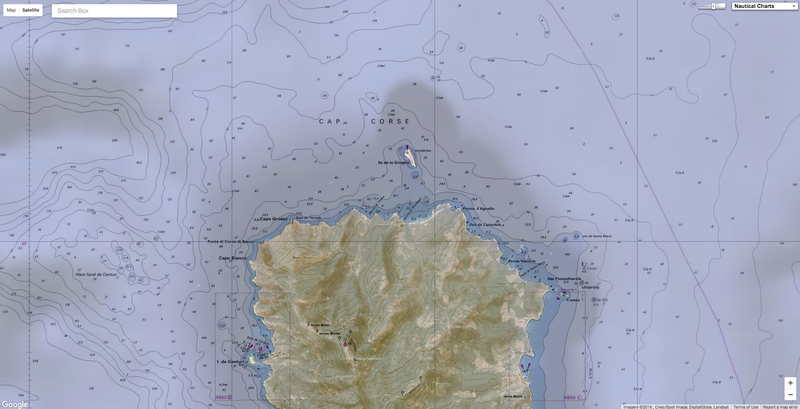 Desceliers includes a further continent called La Terre Australe (The Southern Land) along the bottom of the map. Van Duzer is of the camp that doubts that this has anything to do with what we know as Australia, a continent not represented on his map. He does not address the possibility that this Southern Land might represent Antarctica, the existence of which was no more than a hypothetical belief at that time. In other details, Desceliers provides eye-opening information through both his imagery and the 26 descriptive captions that make this map so unusual. 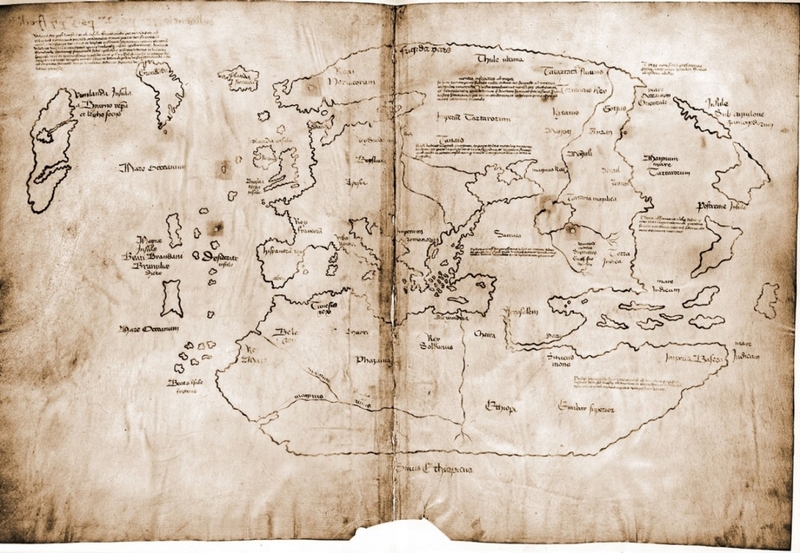 Van Duzer reproduces the map in its entirety, with a large-scale folded version (at about 60 percent of the original size) in a pocket inside the back cover. For discussion within the book itself, he divides the map into 42 rectangular segments and presents each of these, beautifully reproduced in color, with insightful commentary that helps explain some of the peculiarities we encounter. The interiors of Desceliers’ continents are abuzz with human activity, filled with depictions of praying, hunting, and interactions both peaceful and bellicose. We of the New World may satisfy our vanity by considering how Desceliers portrays us. In 1550, the region that is now New Mexico was still a vague concept in European minds, although by then explorers were wandering about looking for the Seven Golden Cities of Cibola, which was ultimately a wild goose chase. Desceliers probably knew nothing about this, but in any case his map doesn’t deal with it. For him, Neufve Espaigne (New Spain) consists of the Caribbean islands and the lands bordering the Gulf of Mexico. Alongside the appendage we know as Florida is the inlet of a river identified as Gofanto merosto (Gulf leading to the eastern sea). This body of water, which did not exist, is a holdover from earlier maps that attached it to the (fictional) Sea of Verrazzano, which the Italian explorer Giovanni da Verrazzano dreamed up as a route that must facilitate passage through the newly discovered continent. A turkey in the margin “is one of the earliest surviving European depictions of the New World bird.” It stands near an architectural grouping (also in the margin) labeled Temixtitan, another name for Tenochtitlán — the ancestor of Mexico City. Except for that, New Spain is essentially left to the imagination. Looking to the north, however, Desceliers has interesting things to tell us about Canada, where French explorers were more active. The name Canada, written boldly in gold, was new to mapmakers; it is thought to have first appeared on a map made in the period 1542-1544. As with more southerly regions, the Atlantic coast is charted in considerable detail, and just off Terre Neufve (Newfoundland) one of the map’s few sea monsters is spraying water from twin spouts. Things get still more interesting as we move westward. Next to them stands a unicorn. Just above the unicorn is a picture of a battle between a band of pygmies and a flock of cranes, explicated by one of Desceliers’ text captions: “Above is an illustration of a people called pygmies, a people of small stature, of about a cubit. At the age of three they procreate and at the age of eight they die without having before their eyes shame, justice, or honesty. For this reason they are called brutes, not men. Van Duzer transcribes all of the captions in their original French and provides accurate translations and enlightening commentaries. Here, he observes that the mythical tale of battling pygmies and cranes goes back to Homer, but that Desceliers’ depiction seems more directly derived from the 13th-century philosopher Albertus Magnus. Albertus set the story in Africa, but more commonly it related to Asia. “This,” Van Duzer writes, “is an interesting case of the migration of ‘monstrous races’ to the New World. Their presence in North America was perhaps inspired by Jacques Cartier’s report, in his account of his second voyage made in 1635-6, that Donnacona, ‘King of Canada,’ told him that there were ‘Picquemyans,’ or pygmies, in Canada.” Desceliers had included a similar scene on a map he made in 1546, but there he placed it in Asia. 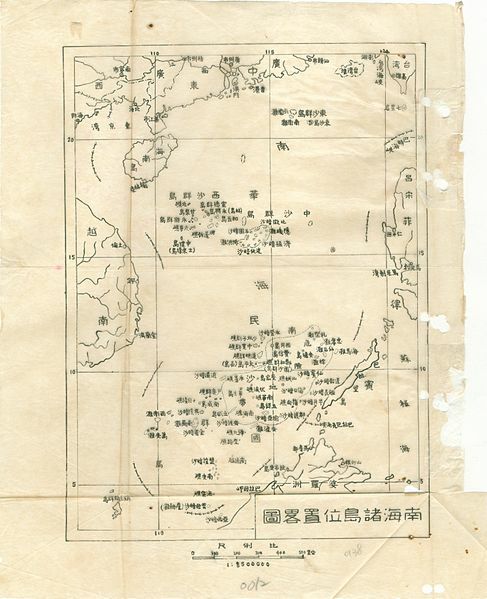 By 1550, Europeans were increasingly clear about the distinction between Asia and America, but Desceliers seemed not quite ready to commit to the cartological border between the two. In his fantasy, the Canadian pygmies and cranes belonged to those two regions separately — or perhaps it was one region together. The 2016 Giraglia Rolex Cup offshore race organized by the Yacht Club Italiano and the Société de Saint-Tropez, set off from Saint-Tropez on 15 June. 268 yacht participated in 64th edition. The race was characterized by a range of weather conditions that eventually favoured the slower yachts. While the 100 foot Magic Carpet Cubed secured line honours, it was the 36 foot French yacht Tip owned by Gilles Pages that prevailed in the battle for overall victory on corrected time. The iconic regatta takes its name from an isolated cliff formation at the northern tip of Corsica, La Giraglia. Here stands a lighthouse, which must be rounded. On the one hand, this lighthouse became the race’s landmark. On the other hand, it heralds the final leg towards Genoa. Throughout the history of the Giraglia Race, to give the endurance race its official title, various different courses have been sailed. However, they have all had one thing in common: La Giraglia had to be rounded. Since 1998, a 243-nautic mile route from St. Tropez to Genoa has become the established course, which sophisticated maxi yachts take on every year.